TeamBuilder is a simple test that determines how you acquire and process information. 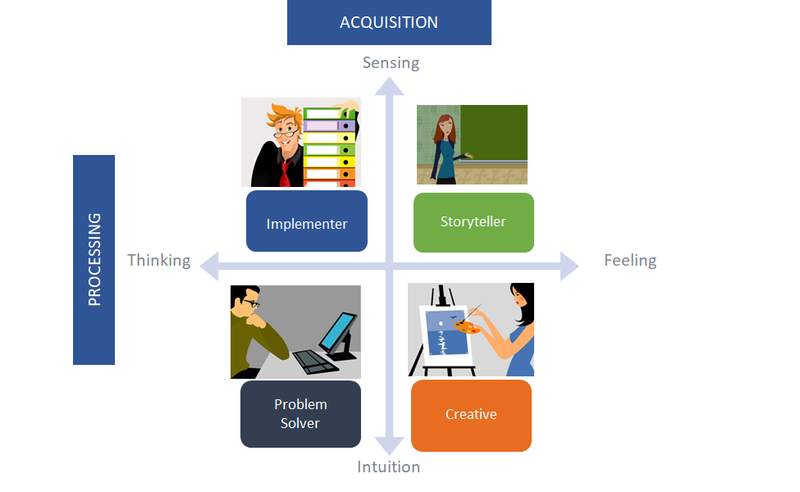 After taking the test, you will be classified into one of four innovation archetypes: The Implementer, The Storyteller, The Problem Solver, or The Creative. Knowing your archetype allows us to better understand your unique contributions to research studies and group meetings. This link will direct you to an online profile that takes less than 10 minutes to complete. Please be sure to allow yourself enough time to be relaxed and not rushed when taking it – this will provide the truest evaluation. The test consists of 14 statements that describe common situations. For each situation, you will be presented two choices that describe how you might respond. Pick the option that better describes you most of the time. Don’t overthink the options, oftentimes your gut reaction is your truest self. At the end of the test, you will receive a result that classifies you into one of four innovator archetypes that describes your unique abilities. That’s it! This assessment is fun, and you might learn something about yourself. TeamBuilder is copyrighted by StandPoint®, Inc.